This bright home is everything a Vermont home should be. 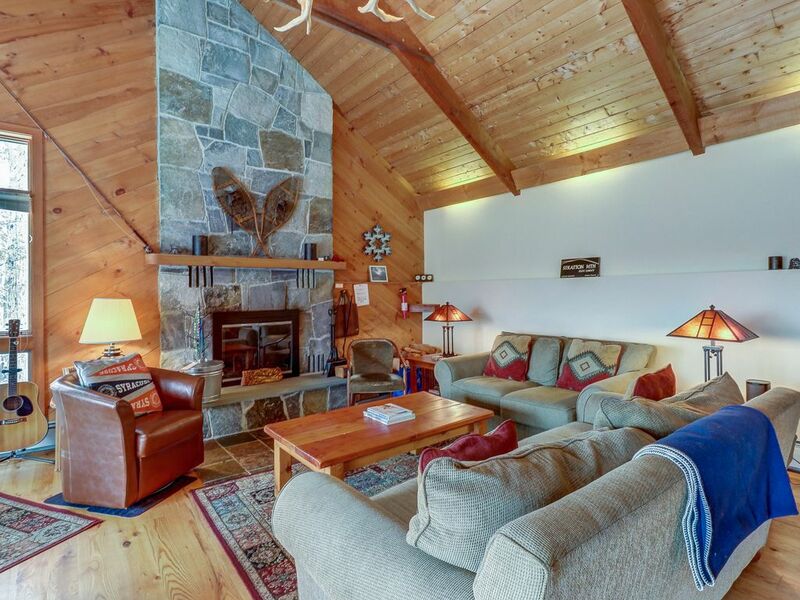 There are beautiful mountain views visible from the windowed dining room, deck, and great room and the open beam ceiling, natural wood accents, and mountain decor all come together for a perfect mountain haven. The private hot tub on the back patio and the steam shower in the upstairs bedroom are both excellent places to relax tired muscles after playing on the mountain. Two master suites and two bunk rooms makes this a great home for families. Stratton and Bromley Mountain Resorts offer everything you need to enjoy the outdoors. In the winter, there is skiing, snowboarding, snowshoeing, snowmobiling, and even dog sledding. In the warmer summer months, there is hiking, biking, kayaking, and paddleboarding, as well as scenic tours, the Bromley Adventure Center and local farmers markets. If you are looking for a little history, Hildene - The Lincoln Family Home, is a stunning property for tours and events. Parking Notes: Parking available in the driveway in front of the home.